Leon Goretzka made his way to the Allianz Arena for the first time since his January agreement with the champions, as Bayern München vs Schalke was defined by three first half goals. 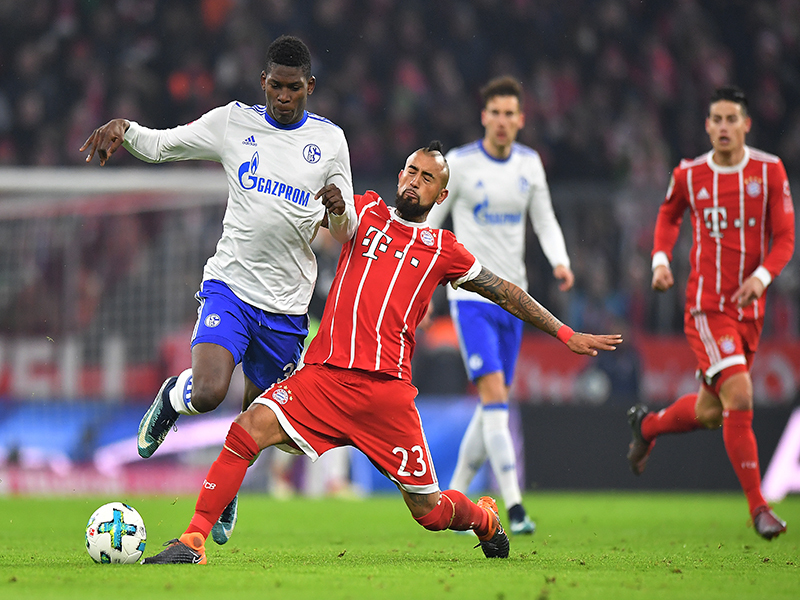 It was Dominic Tedesco who pulled the first surprise of the evening – the Schalke coach returned Breel Embolo to the starting lineup and the Switzerland international repaid that faith immediately. The Schalke forward forcing Bayern ‘keeper Sven Ulreich into a save after just two minutes wasn’t the start many expected. However, Bayern didn’t start this game 15 points clear by chance and it only took the champions six minutes to register the opening goal. Robert Lewandowski sneaked in to grab his 26th goal of the season after Schalke ‘keeper, Ralf Fährmann made a hash of dealing with a long range shot by Thomas Müller. For some reason Fährmann opted to tip the ball straight up into the air rather than pushing it clear and the Poland poacher had an easy tap-in. Schalke – despite the early setback – continued with their game plan to press Bayern high up the pitch. Powered by Embolo the team from Gelsenkirchen looked a constant danger whenever the ball was in a forward position. Midway through the first half the visitors got their reward. Franck Ribéry tried to take on the entire Schalke defence but was stopped in his tracks, the team in white broke quickly. Goretzka found strike partner Embolo on the righthand side and the 20-year-old delivered a dangerous ball which eventually found its way to Franco Di Santo – the striker guided the ball into the net and the visitors were level. Bayern reasserted their lead with nine minutes of the half remaining – Thomas Müller sprinted down the right wing and into the penalty area. Arjen Robben found his team mate with smart pass and just when it looked like the German international had run out of pitch he gave Fährmann the eyes. Somehow with the outside of his boot Müller guided the ball into the net from the most acute of angles, it was a fantastic finish. Schalke looked to start the second half as brightly as they did the first. Giving the hosts something to think about the Royal-Blues got in behind the Bayern backline twice in quick succession. Five minutes after the restart and hearts skipped a beat on the home terrace as Guido Burgstaller went down under a challenge from Ulreich – however, the referee adjudged the forward had gone down too easily and the Austrian was shown a yellow card for simulation. What followed was a dogged battle as both sides tried to find the breakthrough in the second half. Bayern resolute in possession as their visitors tried to press their every move. It took until the 73rd minute for the next goal opportunity to appear. It was Müller again who was involved, squaring the ball for Lewandowski it looked an easy second for the striker but somehow Benjamin Stambouli appeared from nowhere to make an crucial challenge, pinching the ball of Lewandowski’s toe he denied the striker his second and the hosts a third goal. 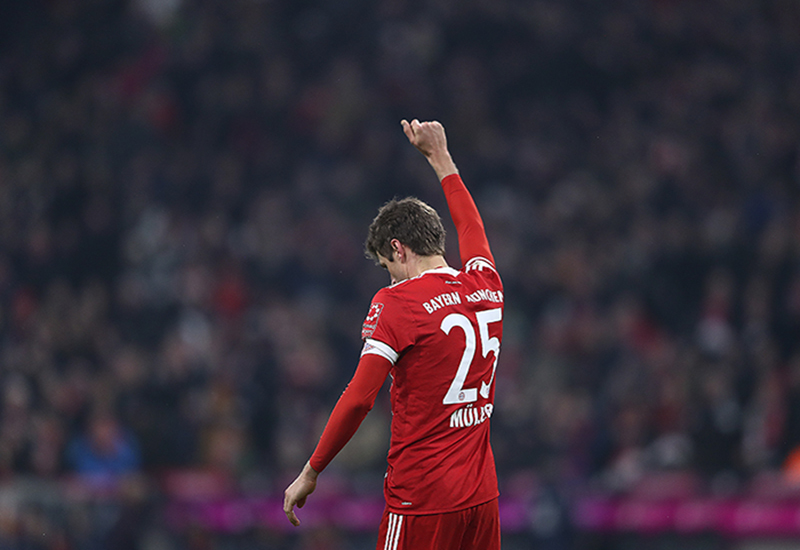 Involved in both Bayern goals Thomas Müller showed his worth to this München side once again. Reborn under the tenure of Jupp Heynckes the forward’s tenacity not only proved to be the catalyst for the host’s opening goal, he then went on to score a sublime second for the Rekordmeister. Many sides have come to the Allianz Arena with the single aim of not getting trounced. Schalke, refreshingly looked to take the game to the champions from the outset. Causing plenty of problems for the home side, the Königsblau will have given Jupp Heynckes something to think about from his sick bed as he plots another treble as the Bavarian’s head coach. Robert Lewandowski becomes only the second player to score in each of the first 11 Bundesliga home games of a season. David Alaba becomes the youngest foreign player to reach the mark of 200 Bundesliga games.